Semiconducting single-wall carbon nanotubes are a NanoIntegris exclusivity. Sorted using our patent density gradient ultracentrifugation (DGU) process. Offered in an acqueous solution or a powder. Figure 1. Optical absorbance plots for our IsoNanotubes-S (99%), respectively. Following the method of Ouyang et al. (Acc. Chem. Res. 35, 1018 (2002)), we can calculate the transition energies for nanotubes in our diameter range (1.2 – 1.7 nm). We see peaks where we would expect them: S33 transitions should lie between ~450-630 nm, M11 transitions between ~600-850 nm, and S22 transitions between ~ 900-1,270 nm. We estimate our metallic and semiconducting enrichment levels based on ratios of the M11 and S22 peak areas after linear background subtraction. Before comparison, the individual peak areas are scaled by empirically determined values for the M11 and S22 extinction coefficients. Figure 2. Neutron activation analysis (NAA) data taken from our IsoNanotube and PureTube powders. NAA reveals that our IsoNanotubes and PureTubes contain significantly lower levels of metallic/catalyst impurities than the raw arc discharge SWNTs from which they are produced. Our IsoNanotube samples, however, contain approximately 5% iodine by mass, resulting from residual iodixanol on the surface of the nanotubes that is not eliminated by our surfactant removal procedures. Figure 3. 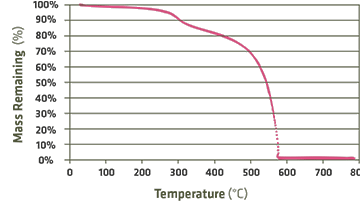 Thermogravimetric (TGA) plots of our nanotube products. Approximately 2/3 of the ~15% mass decrease which occurs between ~200 and ~400°C is attributable to the burno! of residual iodixanol adsorbed to the surface of the nanotubes. NAA data indicates that our IsoNanotubes contain roughly 5% iodine by mass (see Figure 3); iodine comprises roughly half the mass of an iodixanol molecule. The remaining 5% mass decrease is attributable to the burno! of residual surfactant and carbonaceous impurities. Figure 4. Resonance Raman plots for our IsoNanotubes-M (95%). IsoNanotubes-S (99%), and PureTubes, respectively. All Raman measurements were taken using a 514 nm laser. The G/D ratios of our products range from approximately 12 to 41, indicating extremely low levels of amorphous carbon and/or damaged nanotubes. Figure 5. Atomic-force microscopy (AFM) data indicates that our SWNTs range in length from approximately 100 nm to 4 microns. Length histograms of our IsoNanotubes-M respectively.